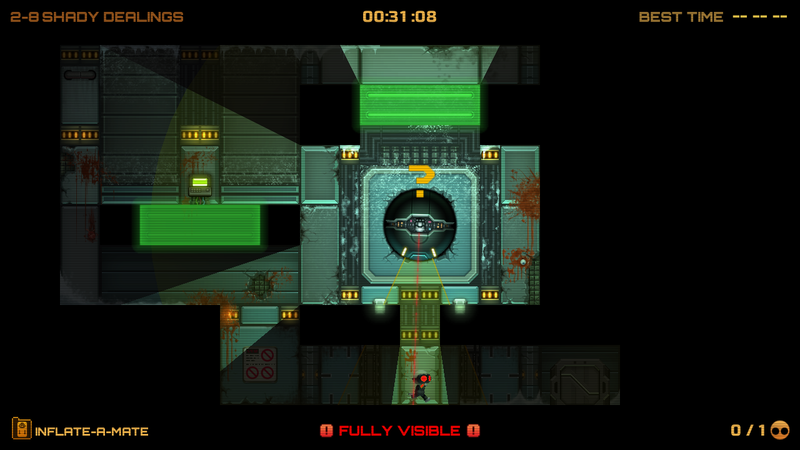 If you are an Xbox gamer you would be forgiven for not knowing what Stealth Inc is. With the first one only being available on PlayStation in the console market and this one being a Wii U exclusive since October last year, it's a series that will fly under most people's radar. But finally this one has made it onto multiple formats for everyone to experience. Is it worth it though? Or would no one have cared if it had stayed Wii U exclusive? So what is Stealth Inc? It's a very unique game that combines the best of at least three different genres. First and foremost is the Metroidvania style. 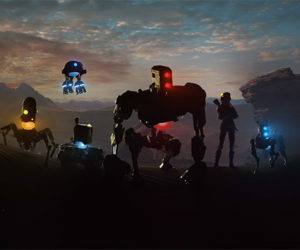 The game's 60 levels are spread out in a hub world that requires you to have certain gadgets to access certain parts. The map is made up of squares also, like any true Metroidvania game. But the sprawling hub world only scratches the surface of what is available. Those 60 levels I mentioned come in the form of test chambers in 6 sets of 10. Each set gives you a new gadget to play with and once you have conquered the main 8 (the other 2 are secret chambers) you acquire that object to traverse more of the hub world. The other two genres that the game encompasses is stealth and puzzle platformer, two genres that you might not think would share a game. But here they are, side by side and it sure is a winning combination. Not being able to be spotted adds depth to the complex puzzles that are placed in front of you. The stealth isn't your average stealth either. You aren't taking it slow and creeping past things at a snails pace. To get past a lot of the enemies you have to move fast while they are looking the other way. The puzzles are always fresh too thanks to the game throwing a new gadget at you in each set of levels. They start you off with no gadget, forcing you to think with simple jumps. After that though you start having to think outside the box and figure out what you can and can't do with certain gadgets. The Infate-A-Mate gadget gives you a small box that when inflated can be used to give you a jumping boost, a ledge to climb on, a weapon to kill enemies with or a simple switch pusher. It is easily the most diverse piece of equipment you will get. The Jack Boy is a neat little device that allows you to hack into enemies and control them, this allows you to move them onto switches or even use their laser to activate laser panels. Some levels will allow you to overcharge the enemies also which makes their laser so powerful you can make them fly. The controls when you are doing so however are extremely sensitive and pretty hard to control. The Adventure light is what you get to play with next and this not only allows you to see but activates light sensitive switches. However, as any stealth fan knows, light isn't always you friend and you can easily end up revealing your location to the enemy. The final 2 gadgets are actually pretty similar in their basic functions but for the more intricate uses they are very different. First you will obtain the Me Too gadget, which allows you to throw a device and spawn a perfect clone of yourself at that location. The catch is whatever you do he does too. You jump, he jumps. You move left, he moves left. This forces you to think about what the repercussions of 2 movements are and will easily confuse you in the best possible way! Finally you get teleporters. Here you have 2 devices to play with and these act as the two ends of the teleporter. If you throw one and hit teleport you will transport to that one since you are holding the other end and whatever is at the location you threw the device to will appear where you were. However you can throw both devices and teleport things other than yourself, including enemies. So with these 5 gadgets there is a hell of a lot of variety to be had in the game and it constantly asks you to think in new ways to reach the finish. There is one final gadget hidden in the hub world called the Camo Suit. This allows you to go invisible for short periods of time, however by the time you get it you will know how to get around everything without it, so it feels pretty pointless. 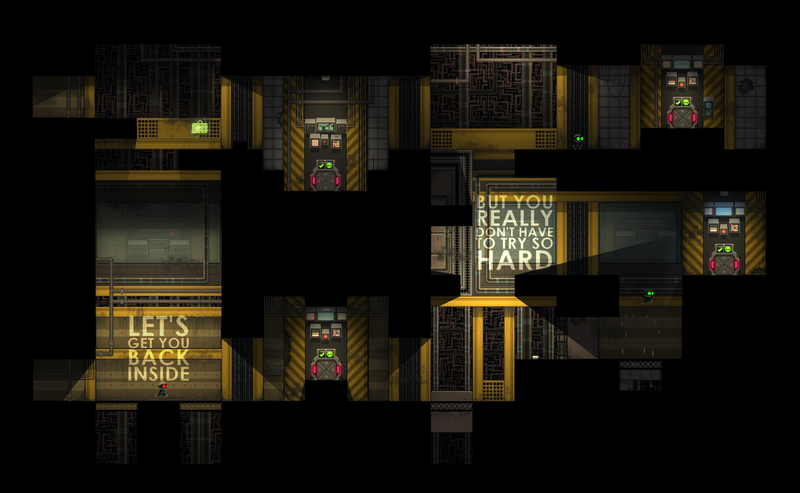 The story in Stealth Inc 2 is a crazy one. One that will make you laugh again and again which is great. Basically you are a clone and you and all the other clones are just test subjects, being forced through more dangerous tests in an attempt to kill you so they can turn your body into burger meat. Your character however has different ideas and you take him through test chambers, rescuing comrades and trying to rise up against the man behind the tests. It's a great little story that has more than a pinch of humour thrown in the mix. The graphics in the game are not going to blow you away like some AAA games out there, but they are a perfect fit for the game. Everything looks smooth and the way the goggles on your clone always are alight with one of 3 colours to tell you how visible you are is a really neat touch too. Your character is undeniably cute also. Audio in the game is also very fitting to the environment you are in. The soundtrack makes you feel like you are in a testing facility. With a hefty 12-15 hour story to play through you might think that's it for the game. 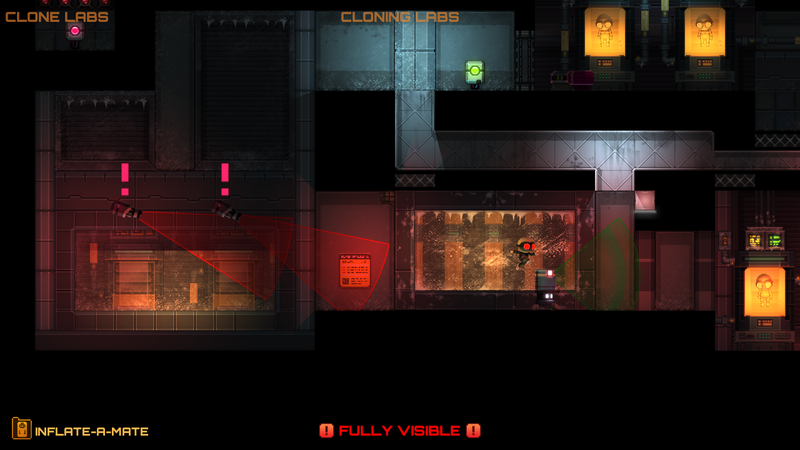 But Stealth Inc 2 goes above and beyond value for money and gives you plenty of reason to come back for more. Whether you want to replay all 60 levels in an attempt to rescue all you comrades and get S ranks or spend time in the hub world collecting the games 26 outfits for your little guy, there's plenty to do within the main game. Value doesn't stop there though. The game also features an extremely in depth level creator that allows you to make your own test chamber. Once you have made one you can upload it for the community to enjoy! There are already some really creative levels already being made and they are a blast to try and beat. The only knock on the game other than the slightly fiddly controls for the overcharged robots is it is possible to get a checkpoint a split second before you die. Forcing you to restart the level over because there is no escape. This only happened to me once the entire time I was playing though and it is entirely possible that you will never run into this problem. 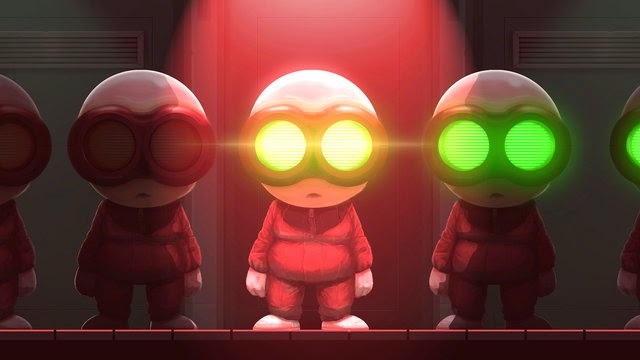 Overall Stealth Inc 2: A Game of Clones is a fantastic game. As I write this review I am itching to get stuck right back in for more. For the asking price the game is an absolute steal and you won't feel shortchanged. If your're a fan of stealth, puzzles, Metroidvania or an combination of the 3 then you will feel right at home with this. What I played: Around 15 hours beating the main game and all secret test chambers. Dabbled in the community levels for an hour or so as well.